As we have been traveling around Europe this last year we’ve seen a lot of interesting and inspiring cultural attractions. Museums, landmarks, churches, and castles have been part of our visit in every country. But my favorite outings have all been hikes. There are a lot of ways to get to know a place, but my favorite is by getting to know its landscapes. It’s usually just Anders and I on the bigger hikes and it turns out to be a good way to get to know my older son, too. A lot of great conversations happen when you have lots of time to think and express yourself. 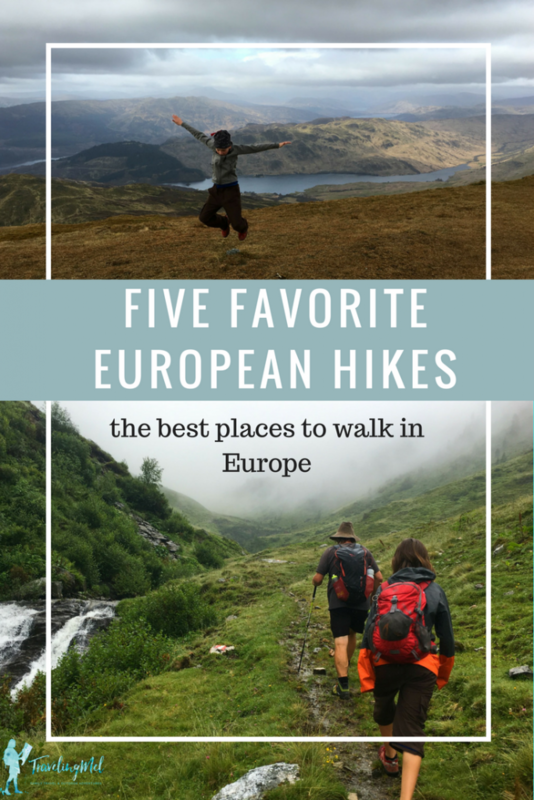 Here are five of my favorite hikes in Europe. St. Nicholas is the highest peak on the island of Hvar at 628 meters. We didn’t know we were going to the top of it, but that’s basically how our walks with Vlado worked. Our Airbnb host showed up at our door and announced that “today we are going for a walk.” The four of us shoved water and snacks into our backpacks, and off we went. The hike to St. Nicholas started with a drive part way across the island. We walked up a dirt road, through a farm and vineyard and then to the peak. St. Nicholas, the mountain, is home to a small chapel dedicated to the island’s patron saint and topped with a cross. On the way down, Vlado asked the owner of the farm/vineyard for three glasses and a bottle of wine. A donkey amused us by nosing up to the table, eating our mandarin oranges, and sucking on Anders’ backpack straps. 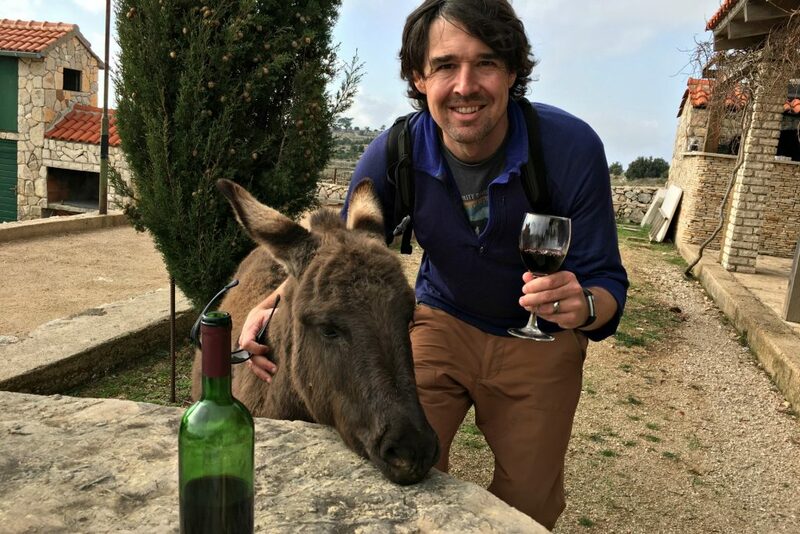 That’s how it is with Vlado, midway through a hike you find yourself drinking Croatian wine with a donkey. After finishing the bottle of wine between the three of us, we walked down the opposite side of the hill from where we started to a large cave that once housed a monastery. It was a steep walk back up to our donkey friend and then downhill to the car. 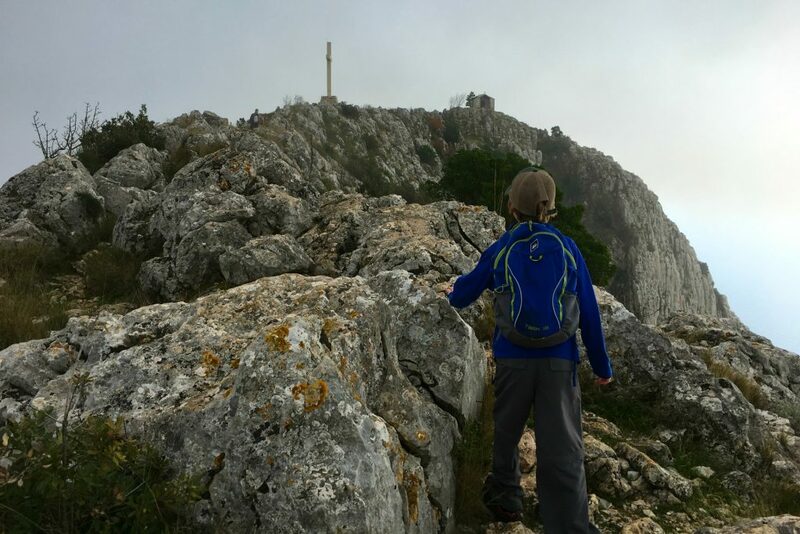 That hike was the first indication that when Vlado invited us for a little walk, it would be more than a stroll through the countryside. I loved every minute of it. 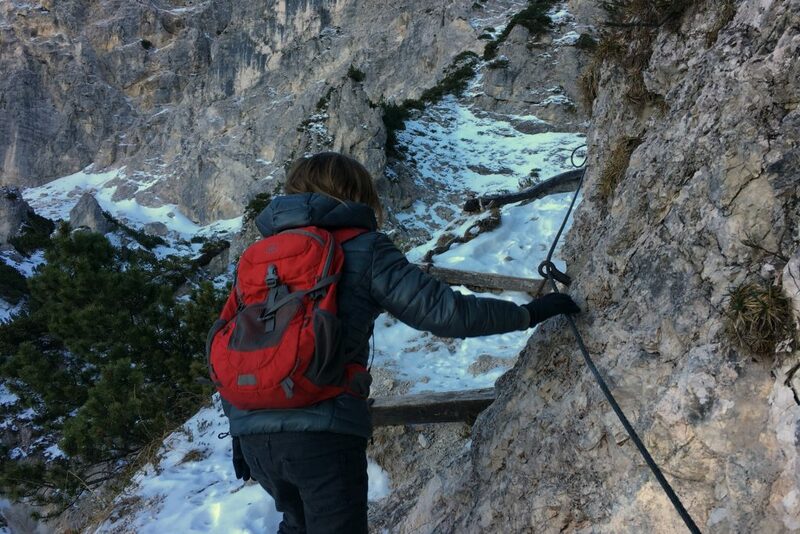 Hiking up Predigtstuhl with Anders was so much fun…and a little thrilling. I wrote about the hike here. It was our first time in the Alps, a little snowier than we anticipated, and required a display of maturity and positive attitude. Anders was a trooper. So was I. Not only was this a lung-buster, it was a little technical. Fortunately, there was cake, beer, and hot cocoa at the top. And a gondola ride down. Like Predigstuhl, Ben Ledi was a mountain we could see from our rental apartment. After staring at a mountain long enough, I felt like I really need to get to the top. Anders and I had so much fun hiking in this beautiful location. You can vicariously hike along with us by watching this video. While exploring Aix en Provence, France we learned a lot about Cézanne. One of the things we learned was that he painted St. Victoire Mountain more than 40 times. 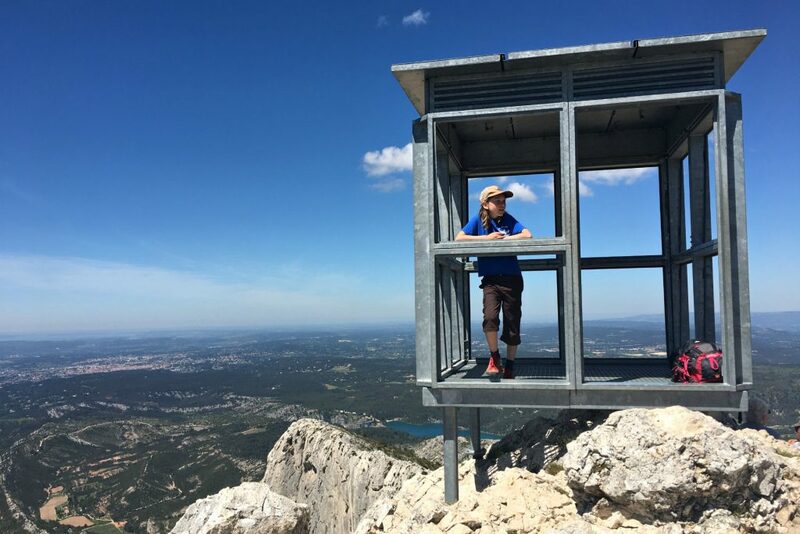 Anders and I decided we needed to see this St. Victoire ourselves and get to the top of it. We took the bus from Aix to a stop seemingly in the middle of nowhere and walked a short way to the trailhead. 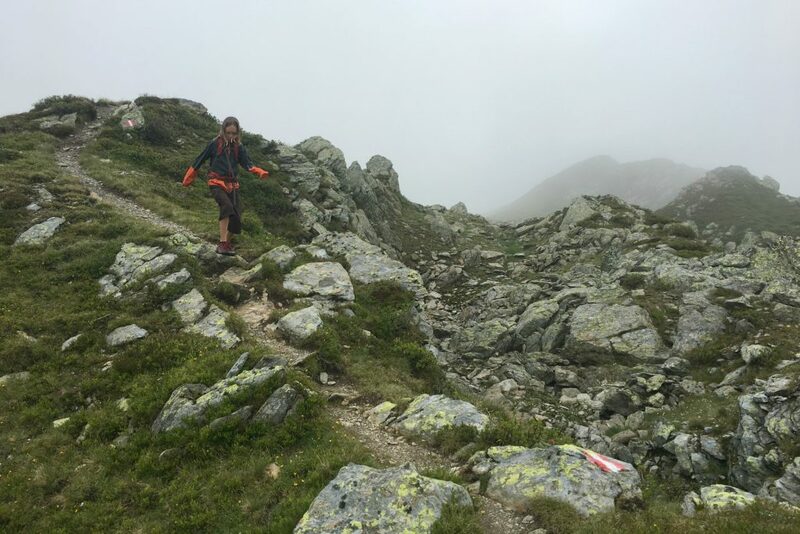 The trail was rocky and exposed and by far the warmest hike of our European walking adventures thus far. I would not want to be up there in summer. It started at a turquoise reservoir and climbed a rocky, arid slope to a limestone peak. From the top, there were stunning views in every direction. A very cool thing about the Tyrol (Tirol) region in Austria is that every little town has a visitor information center where free guided hikes are offered. These aren’t lazy tourist rambles around town, they are serious mountain hikes. Anders and I took advantage of three of these hikes, guided by Fritz, and the whole family went on one of them. If it hadn’t rained relentlessly while we were there, we would have done several more. 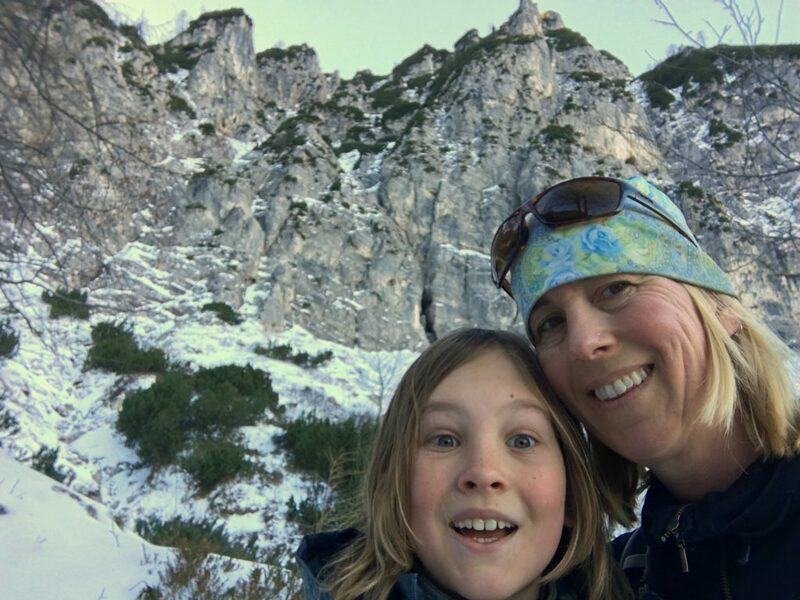 The longest, and probably our favorite hike, was in the Karwald Range of the Alps near Aschau, Austria. 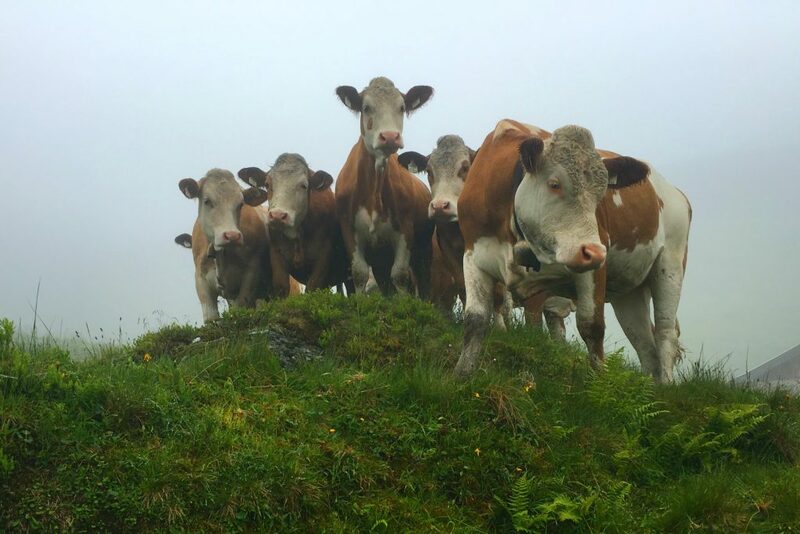 It was a misty, rainy day so we missed a lot of the spectacular Alp-views we normally would have seen, but it was lovely all the same. We would have liked to keep our feet dry, but we were having so much fun it didn’t matter. Some of the trail was really just a path marked by Fritz, which I think he is the only one to use. And like all good hikes in Austria and Germany, this one ended at a mountain house where we could recharge with beer and Almdudler. 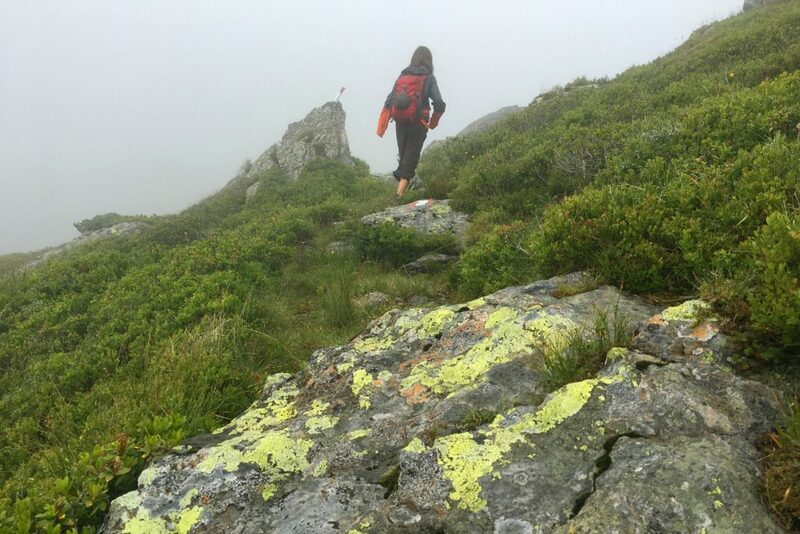 What’s your favorite hike in Europe? Amazing! & great tips! We really enjoyed Drei Zinnen region/national park (Dolomites Italy/Austria). We just passed all the bikers in our car and stopped at trailheads. Though the Drei Zinnen bus up and down was the way to the top of that hiking adventure. It reminded me of GNP with changes around every turn. Thanks for sharing your adventures. Hi Lisa! I really wanted to get to the Dolomites- every photo I see is amazing. Unfortunately, even with a year to travel we can’t get to everything ;). I am going to note that bus name for when we finally get there! Thanks for sharing this! 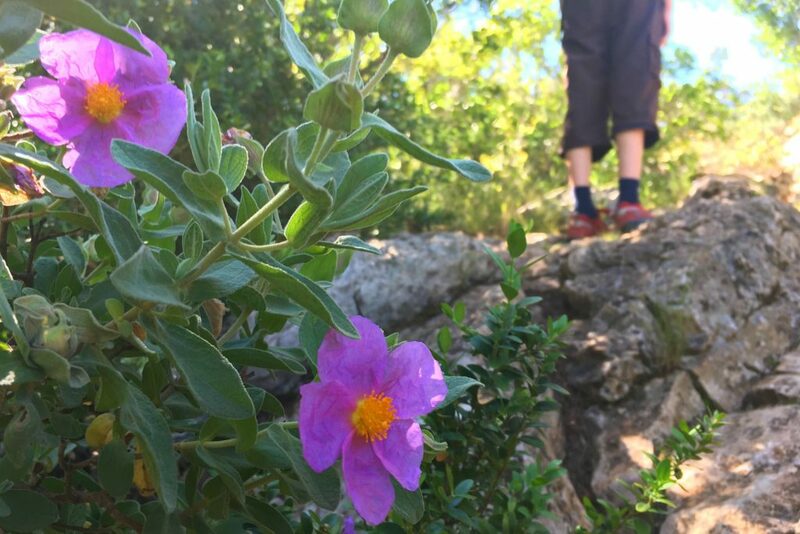 How fun to go hiking with your son! My husband and son just came back from walking Wales so I think they would love the places you’ve gone. Your photos are fantastic, and it looks like you had a blast together. We did! I would love to go hiking in Wales– we could see it from our apartment in Devon, England, but didn’t make it across the channel. I love these hiking recommendations. 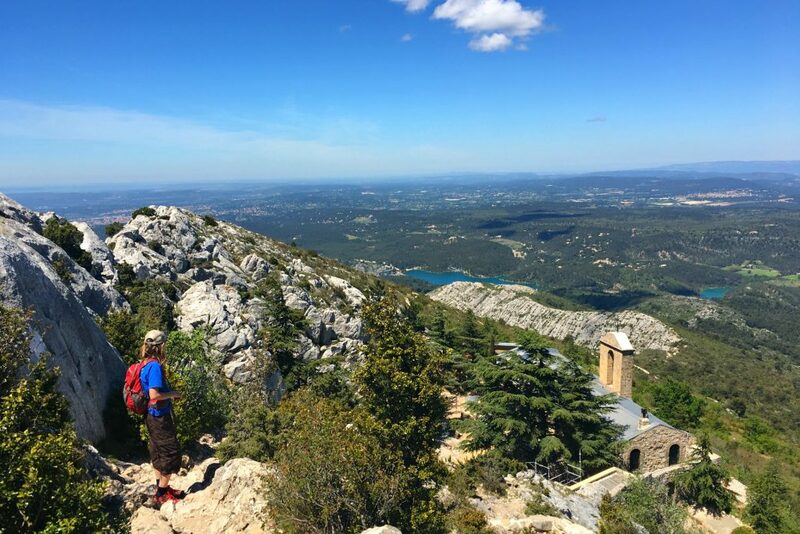 I haven’t done any of these treks but I do love hiking in Europe. 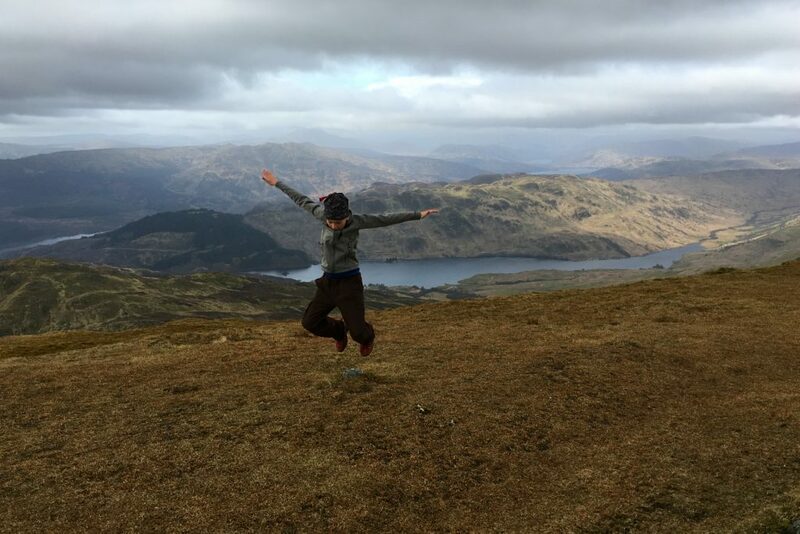 I especially liked hiking in the Lake District and Snowdonia in the UK! I wish we had made it to the Lake District or Snowdonia! Glad to hear there are great trails there. So amazing!! France and Croatia are the places I am really looking forward to visit next. I am really die hard fan of trekking and your pictures has given me a lot of motivation! Glad to hear it. I hope you get to try those trails on your trips to France and Croatia. I love adventurous hikes that involve snow, cold weather, steep slopes and all. After completing all of them I feel so accomplished. 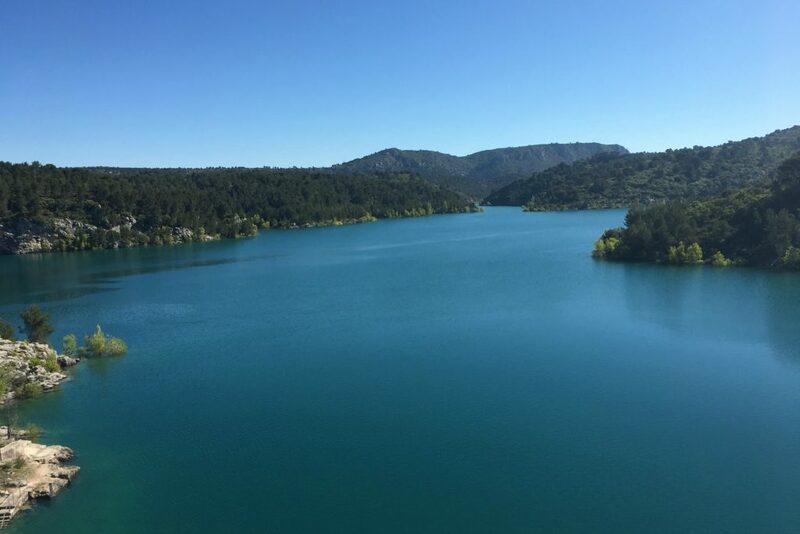 During these hikes you have encountered many beautiful things like those cows in Austria, view of beautiful lake in Provence and donkey friend in Croatia. Lovely pictures with nice tips. I can’t wait to get on the trail! Gladi it was inspiring! I am lucky to see such lovely sights. Whoa. What adventure. I am a hiking person myself and for me the flavour of a place is best judged when you walk through it. Truly loved this guide of yours. Thanks! It’s such a good way to get to know a new place. I’m by no means a hiker, but with cake, beer and hot cocoa waiting at the top, I’d certainly change my tune! I’ve always wanted to see Hvar Island, so I’ll try that one. How sweet is the donkey, it almost looks like they joined you on the hike! That donkey was pretty cute! The treats help keep the kids motivated, too ;)! The views from the Predigstuhl are stunning. This trek seems difficult to me. Good to know that you have covered all of these 5 trails. Loved your photographs and a great write up. I might try one of these treks when get to visit Europe. Wow! Your recommendations are so good. I would love to check out all these places. I hiked in Switzerland and Iceland before, and love these hiking trips. After reading the Croatia one I was thinking “I have to do this one”, then I ended up thinking the same for each of the others! I feel ridiculous that I’ve been in England my whole life and never visited Scotland; you’ve given me more motivation! The donkey cracked me up, who knew they liked oranges?! I think my favorite hike was probably Aschau, though all of them were experiences I hope to never forget. Aschau was pretty amazing. 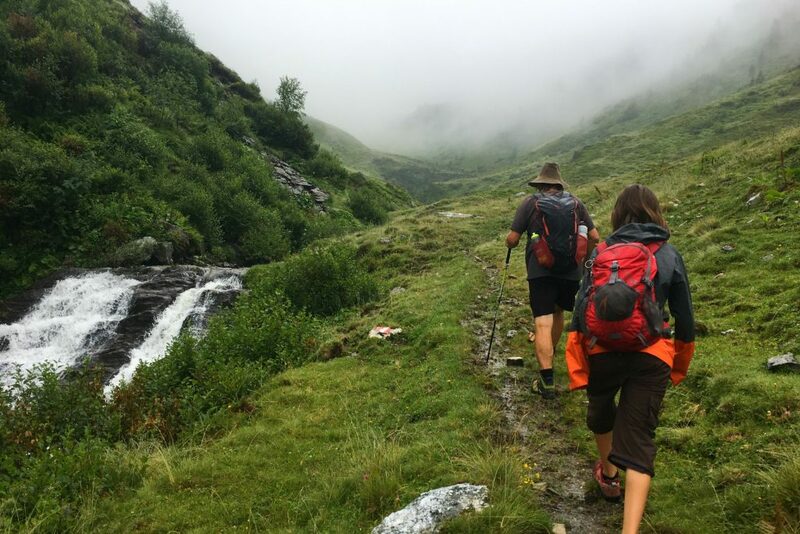 I think we need to go back to Austria in a less rainy month and hike a lot!